I was looking into python code injection recently, and ran across SethSec's blog post. This looked like a great example, and I wanted to run through it myself. First off, I downloaded the PyCodeInjection application and got it running locally. Once the application was running, I verified that I was able to reach it through my browser. I saw the GET requests to the vulnerable application, so I knew that I was up and running. First, I sent a basic GET request with the mentioned parameters to the application. Since nothing came from this yet (obviously), I also sent an example request with the cookie. I knew that this wouldn't cause any injection to occur, but it would let Burp know that there was a cookie that could be passed as well. With my requests loaded up into Burp, I then kicked off Scanner. Within a few second, Scanner picked up on the Python Code Injection and reported it. Forwarding Burp's request to Repeater, I was able to reproduce the 20 second sleep from the payload. After verifying the code injection, I put a quick Python one-liner into my cookie. This will import os, run the popen method on 'id', and then read the object into a string. With my code injection working, I then set out to reproduce this in my browser. First, I URL encoded my payload to prevent any issues with the special characters. 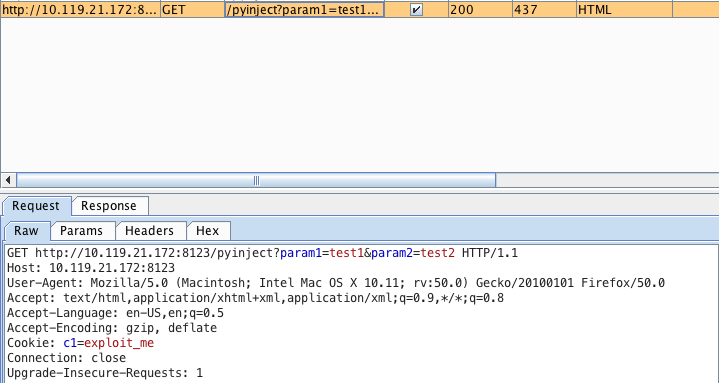 After properly encoding the payload, I sent my GET request and got the 'id' response in my browser! In addition, I decided to integrate my exploit with a modified version of RWSH. Finally, after modifying RWSH (v1.0, stay on the lookout for a new version), I was able to obtain a "shell" with this python code injection. drwxr-xr-x  7 root  root   238 Nov 18 12:49 .
drwxr-xr-x  8 root  root   272 Nov 18 13:06 .. The modified code for this exploit is below. Note that the HTML parsing isn't perfect, so you will have to modify this on a target by target basis. print "\n[*] Connecting to web shell:"
Dope! You should make YouTube vids. I would be nice to see some of your skills/techniques live. Awesome, thanks for that. That’s a pretty good idea, and I’ll let you know once I make the first one! Sounds good! I have a question that doesn’t have much to do with this blog post. I know you got your ECPPT from ElearnSecurity. I’m currently enrolled in the course and studying for the exam. The course comes with a wifihacking section. Does the exam hack some sort of wifi hacking or is this just a bonus section? I don’t even remember a WiFi section in my coursework to be honest. There was definitely no WiFi in my exam though, so you shouldn’t need to be worried about that. Thanks dude! After this exam I plan on either taking the mobile hacking course or web app course. I know you recently got your web hacking cert from eLearnSecurity. I may have more questions for you later on haha. I hope you don’t mind.